Families know that when it comes to saving on electricity bills and being green, one of the biggest ways to make an impact is to buy energy-efficient appliances. Whether it’s a washer and dryer with efficiency monitors or an Energy Star-qualified refrigerator, when appliances work smarter, your home will use less energy without losing function. But buying a better dishwasher and lower wattage microwave aren’t the only ways that families can work to cut down their electric bills and save energy. There are plenty of behavioral and everyday changes that people can make in their homes. 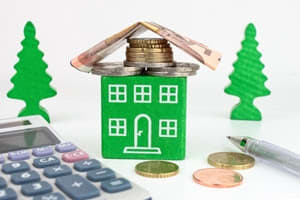 Here are a few of the easiest things that homeowners can do to be greener and save a little money while they’re at it. Reexamine your heating and cooling systems Aside from appliance use, your largest power expenditure is likely your heating and cooling systems. Although these are necessary for maintaining a comfortable and livable environment at home, the U.S. Environmental Protection Agency reminded homeowners that just because you have heat doesn’t mean that you’re using it effectively. As the EPA explained, the typical U.S. home loses about 20 percent of its hot and cool air in the ducts due to leaks. Your family is paying 20 percent of the heating bill to pump hot air outdoors. The problem is that basic physics work against families being able to cool or heat their homes. Hot air is naturally drawn to cool air. In the winter, this means that the heat in your home goes to the cold outdoors through any cracks, leaks or windows. In the summer, it means that hot air from outside is trying to come inside and permeate your cool home. In both situations, the temperature-regulated systems have to work harder (and use more energy) to get the house to the preset temperature. The EPA pointed to new heating and cooling systems as the best way to address this issue, saying that improper installation of heating or cooling systems can reduce efficiency by 30 percent. Another solution is to address the leaks rather than the systems. You can have experts come in and look for areas where air may be escaping fastest. You can repair ducts and install insulation and double-paned windows. Change the way you use water People may not equate the way they use water to energy usage, but the truth is that hot water can have a big impact on your energy bills. Taking shorter showers and limiting the amount of hot water you use in your kitchen are smart solutions, but as Popular Mechanics magazine recommended, the easiest way may be to simply turn down your hot water heater. By reducing the hot water’s top temperature from 140 degrees Fahrenheit to 120, you can save 6 to 10 percent each month and you’ll likely not even notice – water doesn’t need to be that hot. More drastic changes for hot water use include using solar heat and tankless water heaters. When you’re in the mindset of saving energy, it’s smart to conserve water as well. Design website Inhabitat advised families to consider using foot pedal-operated sinks to cut down on the amount of water they use. With foot pedals, people are significantly less likely to leave the water running, as the pedal must be held down. When it comes to energy and water conservation, sometimes the best solutions are the ones that force you to do things differently. Don’t leave everything plugged in all the time The U.S. Department of Energy has a lot of advice for families who are looking to reduce their overall energy intake. One of the DOE’s most important pieces of advice is for families to attach all of their electronics to a power strip that can be turned off easily when not in use. Old advice was to unplug electronics when they’re not in use because while they’re plugged in they still draw “phantom power” from the grid. But now, with the number of electronics that a modern American has, it would be inconvenient to unplug everything while not in use. A power strip achieves the same result as unplugging everything without the inconvenience involved. Illuminate your home better As Midwestern and Southern-based energy company Duke Energy advised its customers and homeowners, there’s a lot of energy to be conserved from the way people light their homes. Using compact fluorescent bulbs rather than standard bulbs can seriously reduce your bills and energy consumption. These bulbs don’t give off heat like incandescent and halogen bulbs do, so they use less energy. Another helpful lighting tip is to install timers or sensors. When you leave your house in the morning frazzled, busy and half-asleep, you may forget to turn off every light. Those lights stay on all day, costing money and wasting electricity. A timer or sensor can help prevent this issue and many more. Conserving energy and reducing your energy bill all comes down to effort from the whole family. Talk about the impact it can have on the environment and your family budget. Incentivize it by making it a game where you can chart your family’s success.